In 1919, Hearst asked the famous San Francisco-based architect Julia Morgan to create something a little bit nicer than the tents. His exact words: “Miss Morgan, we are tired of camping out in the open at the ranch in San Simeon and I would like to build a little something.” And so they did. Over the years, guests to the property included President Calvin Coolidge, Franklin Roosevelt, Winston Churchill, Joan Crawford, Clark Gable, Cary Grant, James Stewart, Bob Hope, Charles Lindbergh, Charlie Chaplin, George Bernard Shaw and yet more celebrities and other notable names. The main house (“La Casa Grande”) was built in Mediterranean Revival style combined with inspiration provided by a Spanish cathedral. The hillside, too, got a new Spanish name: “La Cuesta Encantada,” or The Enchanted Hill. After Hearst’s death in 1951, the property was donated to the state of California in 1957. 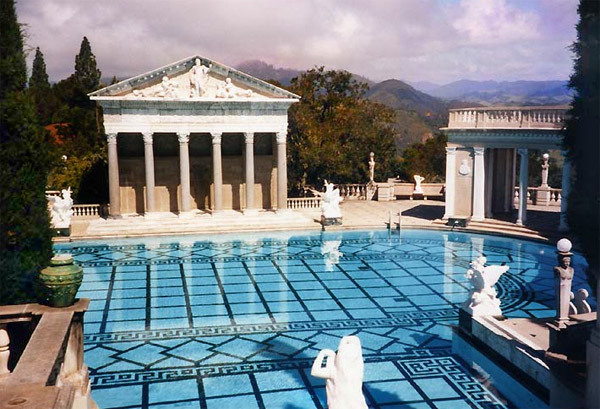 Now designated a State Historic Monument, Hearst Castle is managed by the California State Parks system. Therefore, as strange as it may seem, this opulent estate has been affected by budget cuts. Mainly this means the guided portion of the tours are shorter, but you will have the opportunity to explore the outdoor grounds wihout a tour group. There are several different tours available, and the estate is open every day except Thanksgiving, Christmas and New Year’s Day. Depending on the tour you choose, you will walk more than half a mile and up and down as many as 400 stairs, so comfortable walking shoes are a must. But the effort is worth it: The property has an incredible variety of historical artwork, both on the walls and integrated into the site itself.